Here at Shannon Family Automotive, our owner Larry Shannon has been in the automotive industry since he was 16 years old. Beginning with basic oil changes and progressing with proper training, Larry now owns his own shop. Shannon Family Automotive has been diligently serving the Folsom community since 2001 with a great reputation for quality, convenience, and value. We love serving and helping our community with their automotive needs. We get a lot of new car owners coming into the shop asking just how important an oil change really is. 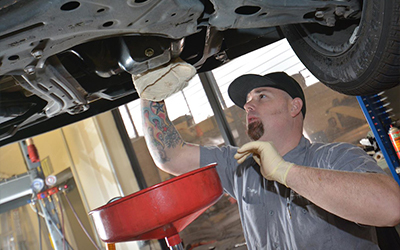 As an auto repair shop in Folsom CA that’s seen their fair share of cars who haven’t had oil changes in years, we explain this importance. Getting an oil change is perpetually on everyone’s to-do list and the one thing where procrastination only makes it worse. The oil in your car can be compared to the blood in your veins. It’s crucial to the life of your car and if you don’t keep your oil clean with oil changes, the oil will get dirty and gunk up in your hoses and engine. Another important factor is to never underestimate the value of having a knowledgeable automotive technician under the hood of your car. Just because you specifically brought in your car for an oil change doesn’t mean that they aren’t going to spot other trouble situations that may cause you to breakdown. When you bring your car into us, we look for fluids leaking out, cracked or frayed belts and hoses, bulging hoses, and safety issues. Ready to schedule your oil change? Call us today!